I have a confession to make - I am a data geek. I love the clear and precise nature of data. Data are foundational to everything. Properly organized data become the building blocks for information, which leads to knowledge and ultimately, wisdom. Medicine is a data rich science, with both structured and unstructured data of a variety of types. If you are a data geek like me then health care should be in your sweet spot. And nowhere are health data and data management processes discussed, analyzed and examined more than at the annual HIMSS conference. However, gathering and aggregating these data, even as discrete elements, is of limited value if they can not be shared. Interoperability is required to really make use of these data and a business model that considers hoarding data to be some sort of advantage is doomed to fail. Data longs to be free. Interoperability is a hot topic in health care right now, and we are sure to see it come into focus at HIMSS17. Interoperability between systems and platforms helps improve performance and helps ensure the right data, at the right time, is where and when it is needed to provide the best possible care. Nationwide interoperability is expected from the U.S. Congress, based on the MACRA Law as well as the 21st Century Cures Act. The entire health care industry, including providers, payers, vendors, policy makers and patients, have come to understand the critical need for interoperability to succeed in a transformed health system that pays for value and outcomes rather than procedures or number of visits. A physician friend of mine puts it like this: "I want to get paid for what I do for my patients not what I do to them," she says. "But I can't manage what I can't measure, and gaps in data lead to gaps in care." There are a number of initiatives and coalitions attempting to address this need; the Sequoia Project (with the eHealth Exchange and Carequality), the Commonwell Health Alliance, and DirectTrust, just to name a few. These are all admirable and successful efforts (disclosure: I am on the Board of Directors for both DirectTrust and the Sequoia Project). However, once standards-based exchange is achieved then it is the use of these data that becomes the key focus. Interoperability is the ability of computer systems or software to exchange and make use of information, without special effort on the part of the end user. Simply transferring bits and bytes around is not the end of the story, but only the beginning. Most exchange today centers around transactional data, but patients should be the focus, not transactions. Of course peer-to-peer connectivity using industry standards do help systems to be interoperable, providing possibilities for improved care, and yet clinicians still have gaps in care as the data picture is often incomplete. There is also the problem of electronic health record (EHR) fatigue from having to click through too many screens, which can lead to burnout and further damage the care process. It takes a robust clinical data network to provide a full longitudinal care record, and a well-designed user interface to make workflow adjustments seamless. Extending network reach by getting the data clinicians need more quickly and efficiently will help to solve for some of these issues. With a powerful network clinicians can focus on the latest, consolidated clinical data which are relevant to a specific encounter. By injecting concise clinical views into workflows more quickly, clinicians are able to spend more time caring and less time searching. 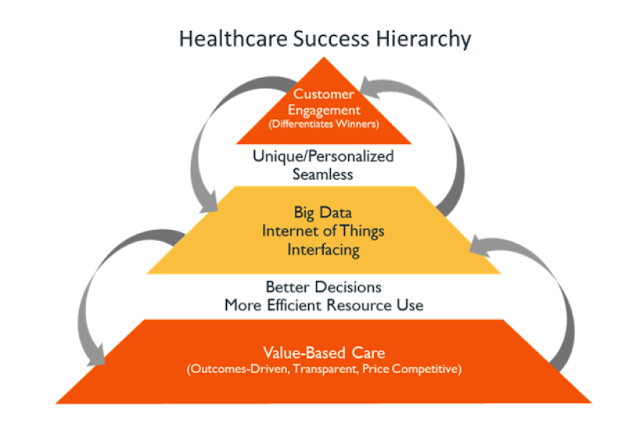 The Cain Brothers consider data in their Healthcare Success Hierarchy and state, "The best way to think about data is to picture it as the middle layer in a three-part hierarchy that depicts the climb between care delivery and customer engagement." Data storage today is almost boundless and very inexpensive. Hard drive capacity has increased 250,000 times over the past 60 years, while the cost per MB has dropped more than 99.99 percent. My smartphone has way more data storage capacity than my first computer did 30 years ago. With cheap, ubiquitous data, we are aggregating massive data repositories, creating what many people call "Big Data." These data are valuable, but only if they can be combined and analyzed in ways that provide actionable insights. Today's search algorithms can find targeted data almost instantaneously, identifying patterns and building a foundation for analytics tools that collate, assess, interpret and visualize data and bring meaning to unstructured information. These tools, when used intelligently, foster informed decision-making. Scott Fowler, MD the CEO of Holston Medical Group, recently wrote "collaboration is the only way to accelerate solving problems and achieving the Triple Aim—and open platforms enable the brightest minds from all corners of the industry to work together." He is exactly right. It is only by working together that we can fix our broken health care system. Together, we can do this.